Join us on Saturday, March 16, for a special night of Music + Generosity as we raise funds to support the students of Mission Hills and STEAM Educational Foundation. 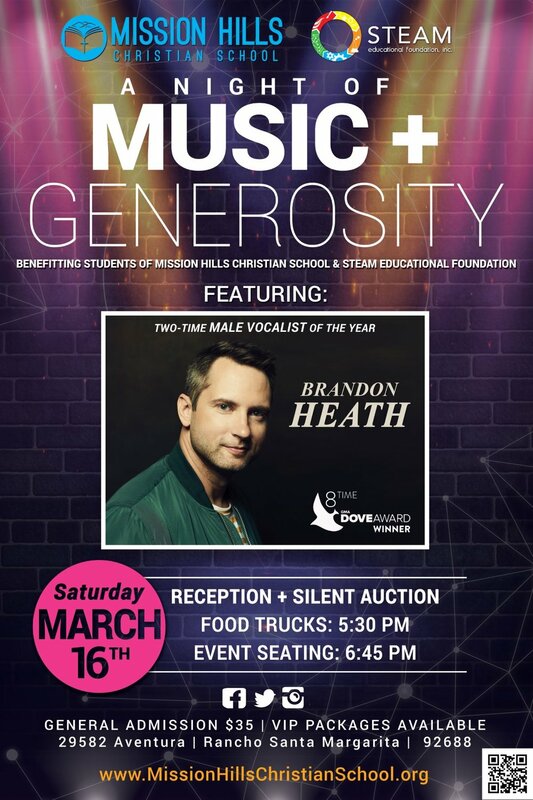 Our 2019 Night of Music + Generosity will feature GRAMMY® nominated singer/songwriter, Brandon Heath. Brandon has won 8 Dove awards including two consecutive Male Vocalist of the Year honors. As one of Christian music’s top artists, Brandon has sold millions of albums and performed for thousands of fans around the country. A limited number of VIP tickets are available that include a Meet & Greet and photo with Brandon, reserved seating in the first six rows, dinner, and a special VIP souvenir. Get your tickets today before they sell out. Proceeds from this special fundraising event will benefit the students of Mission Hills and STEAM Educational Foundation.